The show : How to speak about “la vie d’artiste” (the artist’s life) without recalling so many famous music-hall, circus and variety artists who have performed here before us. It is necessary to mention the Hansa Theater as one of those prestigious places where they have shown their wonderful talents. 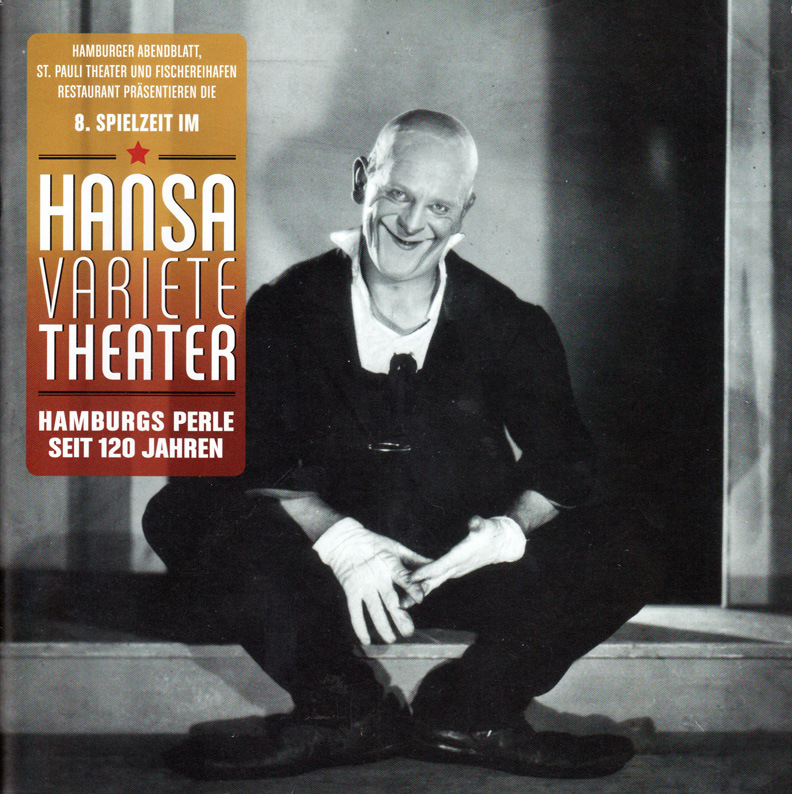 Indeed, the Hansa Theater in Hamburg is one of the greatest and oldest in the history of variety theaters in Europe. It was opened in 1894 and closed only in 2001, except after the 1943 bombing of Hamburg when it was destroyed along with a large part of the city. It was re-opened in 1945 when Hamburg was in the British Zone of Occupation. Pre W.W.II celebrities, included such famous performers as Josephine Baker, the clown Grock, the illusionist and escapologist Houdini and the juggler Rastelli performed there with huge success. More recently and before their exceptional career in Las Vegas, the magicians Siegfried and Roy worked there. In 2008 they returned being VIP guests of the Grand Re-opening audience. 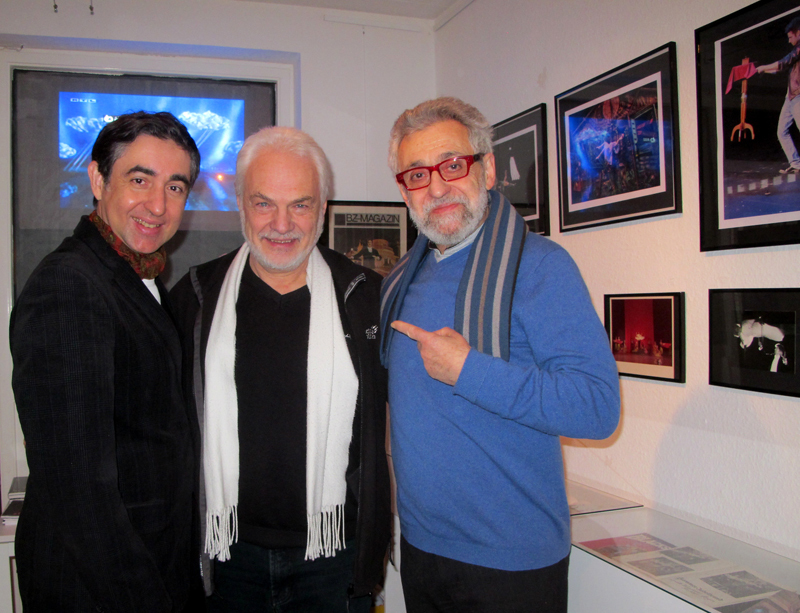 The 2008 revival was due to Thomas Collien and Ulrich Waller, the directors of another very historic Hamburg theatre, the St Pauli. They devised an annual winter season, with 2015 – 2016 being the eighth season with a five month program. It is great to perform there, after so many illustrious predecessors. Already during the Seventies, we had received several offers from the previous manager who was traveling through Europe looking for acts. We didn’t take up those possibilities at that time. However we took up the offer of the 2015-16 season very gladly. Thank you Thomas Collien and Ulrich Waller. Thank you Christiane Schindler. Immediately on arrival at the beginning of October, we are given a very friendly and professional welcome. Everything is carefully organized and planned. And everything will go smoothly until March 2016. During the few rehearsals days, we meet our colleagues. 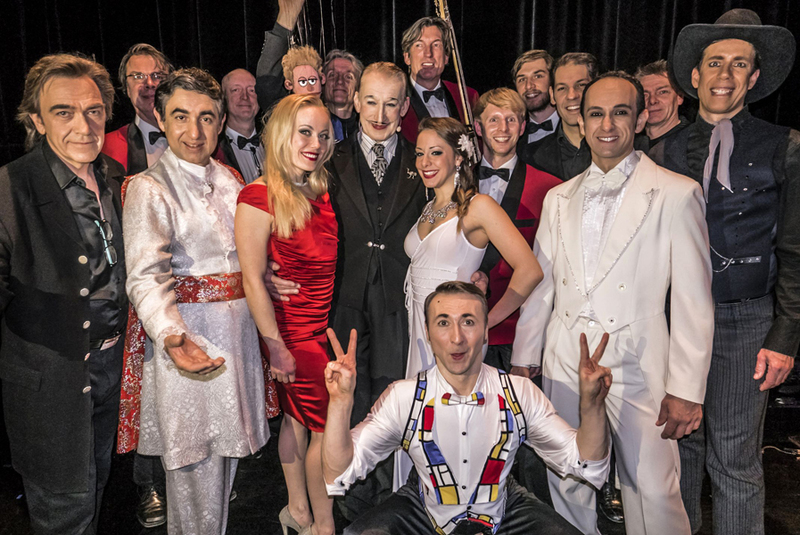 They are all excellent artists : Hans Davis, shadows act; Claudius Specht, juggler; David Weiser, lassos and pistols; Sacha the Frog, contorsionist; Alex and his marionnette Barti; the M.G. Duo, roll shoes; Anna de Carvalho, pole act; and also our friend the magician woman Huang Zheng. Huang stands in for Omar Pasha for three weeks in December while we perform a Christmas show tour in France. Each evening, a host appears between the acts, introduces them and of course shows his own talents. The M.C. changes regularly : they may be for example, comedians, actors, singers or “word jugglers”, each very well known in Germany. They alternate during the season. For us, it brings a novelty each time they change, giving a different rhythm to the show. We spend a lot of our time at the theater. It is well organized to allow everyone to prepare to perform. There are dressing rooms as well as training space. And there is also a so called “green room” where everyone can congregate. There is a monitor screen to follow the show. You can relax there, have a chat, check your phone, read and have a coffee or a tea, with some cakes, chocolates or fruit. On days with two shows, soup and various food is offered. At the interval, we are also joined there by the five musicians and the technical team. After the show, there is some chatting with beer in hand before to leave the theater. Ciao, gute Nacht, bonne nuit, good night, bis Morgen, Tschüss. The refugees : The Hansa theater is located close to the central railway station. Since the beginning of our stay in early October we see on the square, in front of the station, large tents and crowds of refugees, including women and children, with social helpers and volunteers. There are tables and seats, and meals are served. Inside the railway station there are a few tables with people helping to fill in forms. Security personnel are seen everywhere. Quite a short time ago, the German chancellor gave her famous declaration : “Wir schaffen das” “We’ll manage it”. Often in the evening, when we leave the theatre, we cross groups of 30 or 40 refugees accompanied by a few people wearing yellow jackets, walking to emergency housing. They don’t carry much more than a single bag, and sometimes even a sleeping child, his head on their shoulder. Walking back to our accommodation from the theater, those scenes bring us back to the world’s sad reality. In the course of December, all that suddenly stopped. No more tents, no more newcomers. The square is empty, or, better said, given back to the local pedestrians. We feel very welcome. Very quickly we know our way round. We are greeted with smiles at the bakery, at the hairdresser, at the supermarket – where the sales assistants and the checkers recognize us, for our loyalty and for our few jokes in German (even if they are with a French accent). At night, coming back from the theater, we often enter a small shop, a sort of general store, which is also a post office, mainly to buy stamps and mail our letters. The main employee is a German of Turkish origin. As the days go on, we stay longer and longer, chatting about travels, about Istanbul (where we visited when working on cruise ships), about life here or there. A nice meeting : We spend a lovely afternoon with Wittus Witt, at his studio. He is a famous German magician. 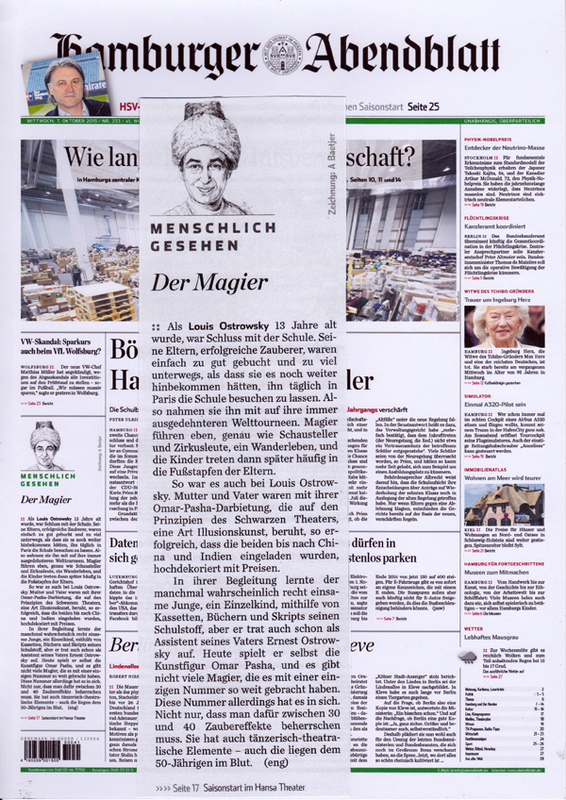 Since 2000 he has published the “Magische Welt” (Magic World) magazine, first established in 1952. He has an extremely interesting and vast collection about magic including posters, videos and all sorts of documents. We spend a long time talking and sharing our memories. To the sound of Ravel’s Bolero, Omar Pasha creates a poetry of wordless magic. From nowhere he causes pieces of fabric, objects and people to appear. Then he makes them to disappear without leaving a single trace – just as he himself disappears at the finale. This is magic of the finest dexterity. In this show it is immediately apparent that the performers combine professionalism, accuracy and speed alongside their artistic presentation. One man holds everything together : that is the illusionist Omar Pasha. Using fabrics and other accessories he makes objects and people move, exchange places and disappear. Finally, a ghost dances, and Pasha himself vanishes. Omar Pasha, with his mind bending magic show, comes from Paris. It is truly amazing how, to the sound of Ravel’s Bolero, he metamorphoses people into ghosts and makes them vanish, creates objects to appear out of thin air and at the end, dematerializes himself.